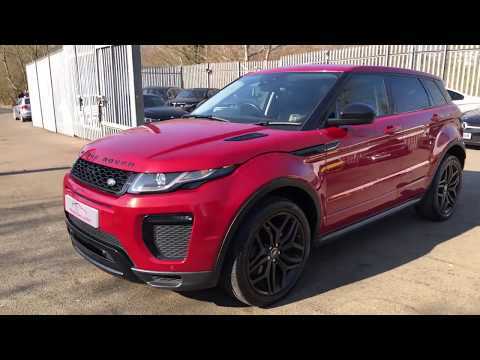 Please find details for our lovely Range Rover Evoque, spec as follows: Firenze Red Metallic---Black Full Leather Interior---Dynamic Bodystyling---20" Multi-Spoke Wheels in Black---Black Design Pack---Panoramic Glass Sunroof---Powered Bootlid - Up & Down---Blind Spot Monitor---Reverse Camera---Electric Memory Seats---Meridian Surround Sound---Lane Change Warning---Touch Screen Navigation - Sat Nav---Bi Xenon Headlamps---LED Daytime Lights---Heated Front Seats---Parking Sensors - Front & Rear---Electric Folding Mirrors---Bluetooth Phone Prep---Bluetooth Audi Stream---DAB Digital Radio---Multi Function S/Wheel---Cruise Control---Privacy Glass---Auto Headlight Activation---Auto Wiper Activation---Air Conditioning---ULEZ COMPLIANT (LOW EMISSION ZONE) - NO T CHARGE This is a rare and highly specced example which includes Panoramic Sunroof, Black Pack, Electric Boot and much more! The car benefits from a Full Land Rover Service History and a long MOT. PAN ROOF - BLACK PACK! !